ahogany Rush is a Canadian Hard Rock band from Montreal, formed by guitarist Frank Marino, bassist Paul Harwood and drummer Jim Ayoub. Heavily influenced by the likes of Jimi Hendrix, Marino's early guitar-work was frantic but engaging, and showed a lot of promise. 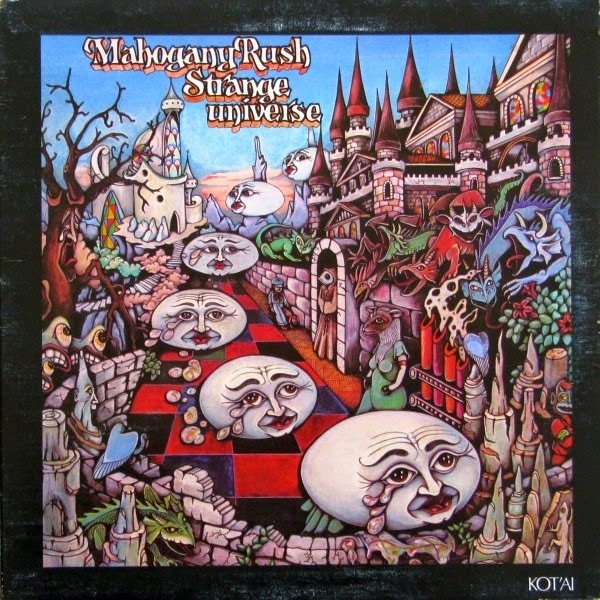 In 1975 released them the third studio album "Strange Universe", a 10 track record which is superbly produced. In my unbiased opinion, this record features his best work of all time. Every cut on this album stands alone as a great force to be reckoned with. From the very different "King Who Stole The Universe" and the sensuous "Moonlight Lady" down to my favorite rocker "Land of a 1000 Nights", 19 year old Frank pulls out all the stops and delivers a solid performance throughout. Great post! I first heard of Frank in 1979 through a hard rock compilation - and been a fan ever since. Still waiting for new material (and his now infamous DVD...). Much appreciated, thank you. And thanks a lot for the Ironhorse album, just found the vinyl version after years of searching (I live in Belgium). Cheers! Thank you Chris C for visiting our blog. Soon we will present more material from "Mahogany Rush" and as I understand you must be fan of 'Canadian Rock'. Always we will be here for comments and requests.